A study published in Neuron in July showed that mice's memorization skills can be enhanced by 200% during sleep. These remarkable findings demonstrated that modifying the rhythm of brain waves of mice while they sleep can enhance their ability to remember what they learned before sleep. The study raised the expectations that humans can also enjoy better memory skills if our own brain waves are modulated in certain ways. The first co-author of the study, Dr. Charles-Francois V. Latchoumane of the Center for Cognition and Sociality within the Institute for Basic Science(IBS), explains the relationship between sleep and memory. Long-term memories, the consolidation of which the hippocampus plays an important role, are associated with sleep. You probably have been told that it is better to sleep, even for a short period of time, instead of pulling an all-nighter before an exam. It is scientifically solid advice as sleep does help to fortify memories. Long-term memory, unlike short-term memory which remains only a few dozens of seconds, refers to anything you remember that happened a few minutes ago or even decades ago. Is your memory really associated with sleep? To be accurate, memory is affected by brain waves during sleep. Spindles, a type of brain waves known to induce deep sleep, are produced in the thalamus of the diencephalon. Some scientists have claimed that spindles may also be involved in memory formation, however there has not been a study to prove that. The research team led by Dr. Latchoumane demonstrated for the first time that memory can be improved when three types of brain waves, including spindles, are properly synchronized. ▲ It was shown that memory can be improved by 200% when three types of brain waves, which only appear during sleep, are synchronized properly. "Our study involved having mice form a fear memory. We found that these memories formed in the hippocampus of the brain were improved by 200% when artificial spindles were administered in sync with other brain waves. On the other hand, such memories could be reduced when the brain neuron function was suppressed. This could possibly reduce the frequency of which one recalls bad memories." Dr. Latchoumane started studying sleep during his PhD program. He found it fascinating that what happens during sleep affects a person while awake. In fact, people who have trouble sleeping experience lots of changes of brain wave patterns. "We all sleep and a lot happens during sleep. Our consciousness changes, memories are formed, and the body is healed. We understand the importance of sleep, however why it is important and how beneficial it is mentally and physically to humans still remain mysteries, which is why sleep study should be continued." Dr. Latchoumane studied engineering physics at the Grenoble Institute of Technology in France. He believes physics can explain how all things work in the universe. What you find in physics can expand to other areas of science, he says. While attending a graduate school in France, he studied medical device development. 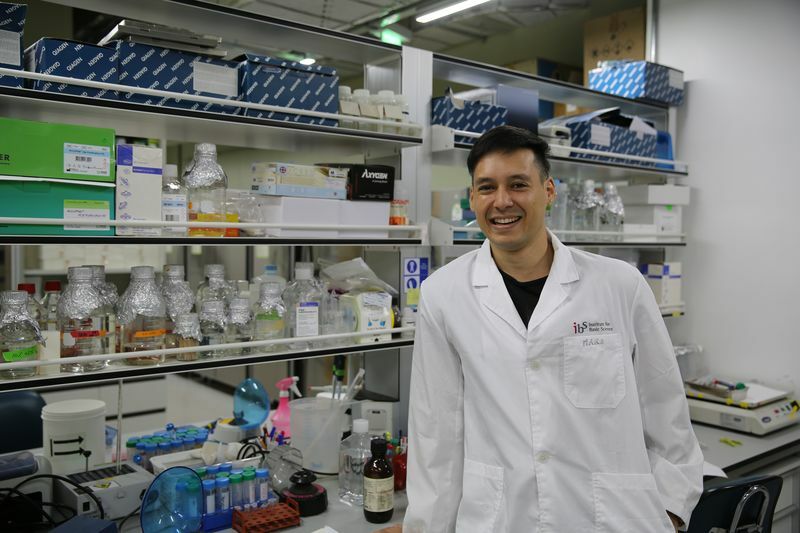 His interest in life/brain science, which started back in France with physics as its basis, led to him delving into brain science in Korea. ▲ Dr. Latchoumane studying brain weaves. He says people will be able to have better memories or forget bad memories when human brain waves can be modulated with non-invasive methods in the future. He attended a graduate school program of Korea Advanced Institute of Science & Technology (KAIST) after moving to Korea in 2004. In the program he learned how to analyze brain signals. Since then, he has focused on comparative study of the brain waves of patients with mental illnesses, such as dementia, ADHD, alcohol addiction, and PTSD, compared to normal brain waves. For example, his study involves predicting who are more likely to suffer from dementia based on brain wave patterns by comparing the brain waves of dementia patients and those of healthy individuals. He saw first-hand how useful brain wave pattern analyzation can be for brain/mental disease diagnoses by conducting such research. "The deep brain sends different signals, unlike the ones from the cerebral cortex. Deep brain stimulation(DBS) is a main type of treatment used to relieve the symptoms of Parkinson's disease. However, it is quite challenging to conduct this research on humans as the area is deep in the brain. My goal is to develop a machine that analyzes brain waves from the deep brain. I believe this dream of mine started from my experience of developing medical devices when I was younger. If possible, I would like to develop a system in which brain waves from all parts of the brain can be analyzed in 3D." Dr. Latchoumane primarily used electrodes placed along the scalp to observe brain wave patterns during sleep. How is it possible to detect waves from the inside of the brain only using electrodes attached to the scalp without any surgical method? Dr. Latchoumane says there are two reasons behind this: first, signals produced by neurons, the nerve cells of the brain, are electrical signals; second, all neurons are headed in one direction (the directions of axons towards the surface of the brain) in the cerebral cortex, which means their signals are intensified, rather than offset. "An electroencephalogram(EEG) is a test that detects electrical activity in the cerebral cortex. There are so many things we can find out from brain waves. It goes beyond reading emotions and thoughts. Brain waves are what make it possible for patients who lost a limb to move a prosthetic arm or leg. Decoding brain waves allows diagnoses of certain diseases as well." Dr. Latchoumane conducts brain wave analyzation mainly using mice. His experiments on mice started when he met Director SHIN Hee-Sup of the Center for Cognition and Sociality in 2010. EEG can be used on humans to analyze brain waves, however gene editing or brain wave manipulation are limited as only minimal stimulation is allowed on humans. "Changing certain genes of a mouse can lead to behavioral changes as well. The correlation between brain waves and behaviors can be inferred from this since different brain wave patterns are observed before and after certain genes are edited. For example, our team has worked on which gene makes a mouse lose consciousness. After this gene was either removed or controlled, the mouse failed to fall asleep and kept waking up as it could not lose consciousness. The brain wave pattern shown here was different from the one before the gene modification." 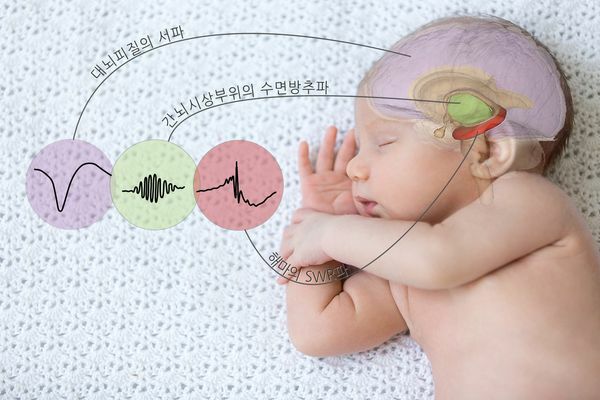 Dr. Latchoumane conducted an interesting brain wave study with Korean scientists. He was requested by Amorepacific, a Korean cosmetics company, to produce a video that helps improve skin’s appearance. He and his colleagues believed that when people's mood improves their skin would also become healthier. The research team studied which colors and shapes visually help people to feel positive emotions and what combination of sound tempos and tones acoustically is preferred by people. He then analyzed brain waves of subjects and asked how happy they felt while watching the sample videos that the team has created, which led to three complete videos for mood boost. Amorepacific later used these in a promotional video featuring their positive effect on skin. This project drew a lot of attention with a number of media companies covering the project. ▲ 2006 cosmetics campaign using the research outcome produced by Dr. Latchoumane and his fellow scientists. This popular skin therapy series consist of three videos for three different skin concerns by helping people to feel happy and relaxed. Curiosity is what most motivates Dr. Latchoumane, who embraces new challenges. He smiles saying that there is so much to do in the unknown areas of brain science. We hope to see his pioneering research helps us to release "happy brain waves" someday.